School of Environmental Science and Engineering, Dalian Maritime University, Dalian, China. Copyright © 2013 Jin Zhang. This is an open access article distributed under the Creative Commons Attribution License, which permits unrestricted use, distribution, and reproduction in any medium, provided the original work is properly cited. In order to improve adsorption capacity of granular activated carbon (GAC), potassium permanganate was used to react with GAC to change the surface properties and improve the adsorption capacity of GAC. By batch experiments, improvement of adsorption capacity of potassium permanganate modified GAC (GACM) was studied. The influence of adsorption time, temperature, ratio of phenol with GAC/GACM, initial concentration of phenol and pH on adsorption efficiency of GACM was studied. The results showed that modified by potassium permanganate, the adsorption capacity of GAC improved to a higher level. The removal efficiency of phenol increased to about 20%. With the development of chemical industry, more and more organic compounds were disposed into water and aggravated water pollution. Adsorption is an effective technology in removing organic pollutants from water [1-3]. In which the number of adsorbents, activated carbon has be seen as one of the main and effective adsorbents. Activated carbon has high surface area, large pore volume, tunable pore size, chemical stability, high hydrophobicity and interconnected frameworks [4-8]. While, pore structure and surface properties affect the adsorption capacity of activated carbon [9,10]. To improve the adsorption efficiency and save dosage, in recent years, many researchers have dedicated on researches of modification of activated carbon [11-18]. The use of oxidizing agents is the most common methodology to modify AC surface [19-22]. Some researchers have found that carboxylic functional groups can be introduced upon oxidizing the surface of carbon materials by various oxidation agents such as concentrated nitric , ozone , ammonium  and H2O2 , which could help to change the inert and hydrophobic nature of carbon materials and enhance the wettability for polar solvents and make the surface active for the immobilization of organic compounds via adsorption . For example, Gil et al. studied the oxidation of HNO3 and found that under different temperature, oxidation of HNO3 would affect the macro and micro porous structure of activated carbon. Liu et al. found that modification of air oxidation improved the wettability and the adsorption properties of pitch-based spherical activated carbon as the increase of the oxygen-containing groups. Yin et al. reviewed the chemical, physical and biological modification techniques of activated carbon, and found that the beneficial effects of specific modification techniques on activated carbon adsorption of targeted contaminant species from aqueous solutions were profound. Utrilla et al. compared the advantages and disadvantages of different methodologies to modify the surface of activated carbons and found that modified by using H2O2, O3 and HNO3, acidic surface functional groups increase in the AC surface as the reduce of the AC surface area; and the nitrogenation or sulfuration of the AC surface can increase its basicity favoring the adsorption of organic compounds. As an oxidant, potassium permanganate has been widely used in water treatment [30-35]. In this paper, activated carbon was modify with potassium permanganate, and with representative organic matter of phenol, the impact of modification on adsorption capacity of activated carbon was studied. The particle size of granular activated carbon was 10 - 20 mish. After repeatedly soaked and washed with deionized water, the activated carbon was dried to constant weight at 105˚C for over 24 h.
Modification of GAC was conducted under neutral condition. The activated carbon was immersed in pollution of potassium permanganate (controlled the ratio of concentration of potassium permanganate to activated carbon (L/M) to a certain value) for a certain period of time and slow stirring with constant temperature oscillator, then separated and washed repeatedly with deionized water to no color, then dried to constant weight at 105˚C for 24 h.
Adsorption experiments were performed to study the effects of important parameters such as effect of temperature, amount of adsorbent, time of contact and pH, ratio of phenol with GAC/GACM, initial concentration of phenol in water was 250 mg/L. 250 ml of water (contaminated with phenol) was taken into 500 ml volumetric flask, then 2 g of adsorbents (GAC/GACM) was put into the flasks. The flask was then subjected to shaking for proper adsorption on magnetic stirrer for a certain time. After the fixed time of contact, these solutions were filtered with filter (whatman filter size 0.45 μm PES filter media ) and the amount of the phenol adsorbed was analyzed. The concentration of phenol was analyzed with liquid chromatography. The chromatography column was Century SILC18-EPS (200 × 4.6 mm, 5 μm), made in Germany. The mobile phase was acetonitrile 50%-water 50% of volume proportion. Column temperature was 20˚C, and column pressure was 11.0 MPa. The flow rate of mobile phase was 1.0 mL/min. The detector was UV detector, and with detection wavelength of 270 nm. 2 g GAC was modified with 20 mL different concentration of Potassium permanganate solution of 10.0, 15.0, 20.0, 25.0, 30.0, 40.0, 50.0, 60.0 mg/L for 90 min previously. The initial phenol concentration was 250 mg/L. The adsorption time of GACM for phenol was controlled for 4 h. Temperature was 20˚C. Effect of potassium permanganate concentration on adsorption efficiency of GACM for phenol was shown in Figure 1. It could be seen that modified with different concentration of potassium permanganate, the adsorption efficiency of GACM for phenol differed. At begging, the removal efficiency of phenol increased with the increase of concentration of potassium permanganate. 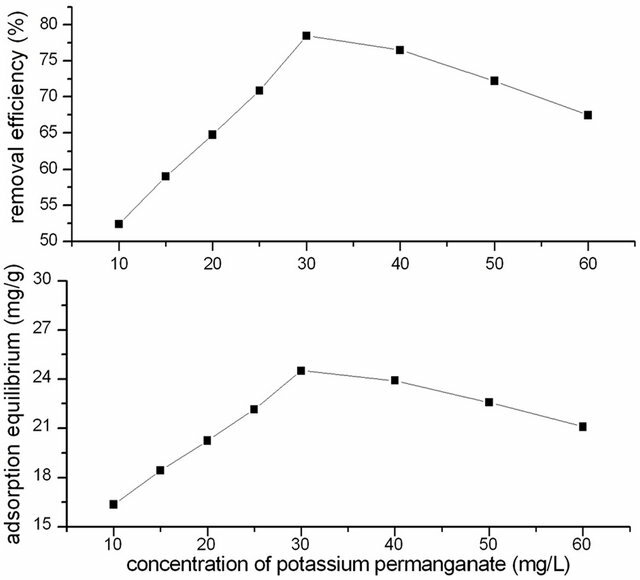 When concentration of potassium permanganate increased to 30 mg/L, the removal efficiency of phenol increased to the highest, and then decreased with the increase of concentration of potassium permanganate. This could be because that with the increase of concentration of potassium permanganate, there are more and more potassium permanganate react with GAC and oxidized the surface of GAC, and formed more pore structure and functional groups in GAC surface, which would increase the adsorption capacity for phenol. But when concentration of potassium permanganate increased to a higher level, excessive potassium permanganate would react with the surface function groups, which would decrease the adsorption capacity of activated carbon otherwise. From results of Figure 1, it could be concluded that for 2 g GAC, the optimum concentration of potassium permanganate was 30 mg/L. In process of modification, the concentration of potassium permanganate solution was 30 and 40 mg/L, and the dosage of GAC was 2.0 g. Modification time of GAC with potassium permanganate was controlled at 10, 30, 60, 90, 120, 150, 180, 210 min respectively. Figure 1. Effect of concentration of potassium permanganate on adsorption capacity of GACM. water. Temperature was 20˚C. 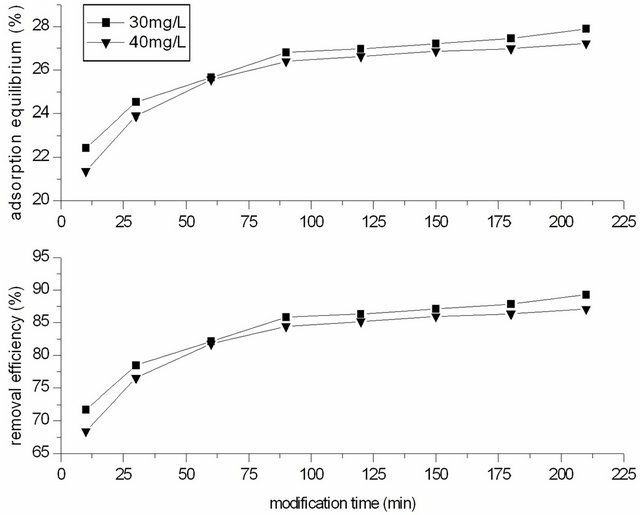 The phenol concentration was 250 mg/L, and the dosage of GACM was 2.0 g (that is the ratio of phenol with GACM was 62.5:2.0 mg/g), and adsorption time was 4 h. Figure 2 showed the effect of modified time on adsorption capacity for phenol of GACM. It could be seen that the removal efficiency for phenol increased with the increase of modification time of GACM. At beginning, the removal rate increased very fast, and when modification time increased to 90 min, the removal rate increased gentle. At the same time, it could be seen that when concentration of potassium permanganate was 30 mg/L, the removal efficiency of phenol was higher than that of 40 mg/L. So on later, for 2.0 g GAC, the concentration of potassium permanganate was controlled at 30 mg/L, and the modification time was 90 min. Temperature is 20˚C. 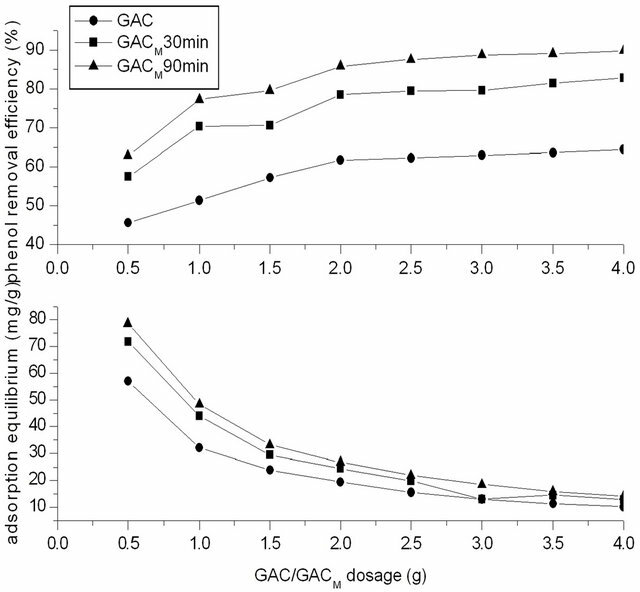 Ratio of phenol with GAC/GACM was 62.5:2.0 mg/g. Results of adsorption capacity versus time were shown in Figure 3. It could be seen that for GAC and GACM, the adsorption capacity for phenol increased with the increase of adsorption time to about 4 hours, and then were nearly at constant. This showed that the adsorption for phenol of GAC/GACM was reached equilibrium at nearly 4 hours. At the same time, it could be seen that the equilibrium of GACM was about 28 mg/g, while of GAC was 20 mg/g. This showed that the adsorption capacity for phenol of GACM was greater than that of GAC. Figure 2. Effect of modification time of GAC on phenol removal rate by GACM. Figure 3. Effect of adsorption time. spectively. In 250 mL water, the dosage of GAC/GACM was 2.0 g, and the concentration of phenol was adjusted to 50, 100, 150, 200, 250, 300, 350, 400 mg/L to satisfied the ratio of phenol to GAC/GACM was 12.5:2.0, 25.0:2.0, 37.5:2.0, 50.0:2.0, 62.5:2.0, 75.0:2.0, 87.5:2.0, 100.0:2.0 mg/g. Adsorption time was 4 h. The effect of temperature on removal of phenol at different ratio of phenol to GAC/GACM was shown in Figure 4. The results showed that the removal efficiency for phenol decreased with the increase of temperature. When temperature increased from 20˚C to 30˚C, the highest removal efficiency for phenol decreased to 50.86% from 61.47% with GAC, and decreased from 78.46% to 61.02% with GACM. That is to say that the adsorption for phenol with GAC/GACM is exothermic, and the lower temperature is favorable for adsorption for phenol by GAC/GACM. At the same time, it could be seen that the effect of temperature on adsorption for phenol with GACM was as the same as that with GAC, but at same temperature, the adsorption capacity of GACM was higher. On later experiments, temperature was 20˚C. The concentration of phenol in water was 250 mg/L, and the dosage of GAC/GACM was adjusted to satisfy the ratio of phenol to GAC/GACM was 62.5:0.5, 62.5:1.0, 62.5:1.5, 62.5:2.0, 62.5:2.5, 62.5:3.0, 62.5:3.5, 62.5:4.0 mg/g. Previous modification time of GACM was 30 and 90 min respectively. Adsorption time was 4 h. Result of Figure 5 showed the effect of dosage of GAC/GACM on removal efficiency for phenol from water by adsorption of GAC/GACM. Figure 4. Effect of temperature on the adsorption rate for phenol by GAC/GACM. Figure 5. Effects of dosage of carbon on the removal rate. with the increase of GAC/GACM dosage. That is to say that when dosage of activated carbon was insufficient, the adsorption of activated carbon reached saturation easily, and the removal efficiency of phenol was low. With the increase of dosage of activated carbon, the removal efficiency of phenol increased. When dosage of activated carbon was smaller than 2.0 g, the removal rate for phenol increased fast with the increase of GAC/ GACM dosage. While when dosage of activated carbon was larger than 2.0 g, the removal rate for phenol increased slowly, and at that time, the equilibrium adsorption capacity was lower. This is because that when dosage of activated carbon was sufficient, the phenol was removed all the nearly. Increase of activated carbon would increase the costs. Therefore, the dosage of activated carbon should be appropriate. From results of Figure 5, it also could be seen that the optimum dosage of activated carbon has nothing to do with modification or not. At experiment condition, the optimal ratio of phenol to activated carbon was 62.5:2.0 mg/g. At the same time, the adsorption capacity of GACM was higher significantly than that of GAC. For example, the removal efficient for phenol with GACM, at ratio of phenol to activated carbon was 62.5:1.2 mg/g, was higher than that of GAC at ratio of 62.5:4.0 mg/g. At the same time, modification time influence the removal efficiency for phenol by GACM. With modification time increased to 90 min from 30 min, the removal efficiency for phenol increased to a higher level. Adsorption time was 4 hour. The GAC was modified by potassium permanganate pollution of 30 mg/L, temperature was 20˚C. Dosage of GAC/GACM was 2.0 g, and the concentration of phenol in water was adjusted to satisfy the ratio of phenol to GAC/GACM was 12.5:2.0, 25.0:2.0, 37.5:2.0, 50.0:2.0, 62.5:2.0, 75.0:2.0, 87.5:2.0, 100.0:2.0 mg/g respectively. 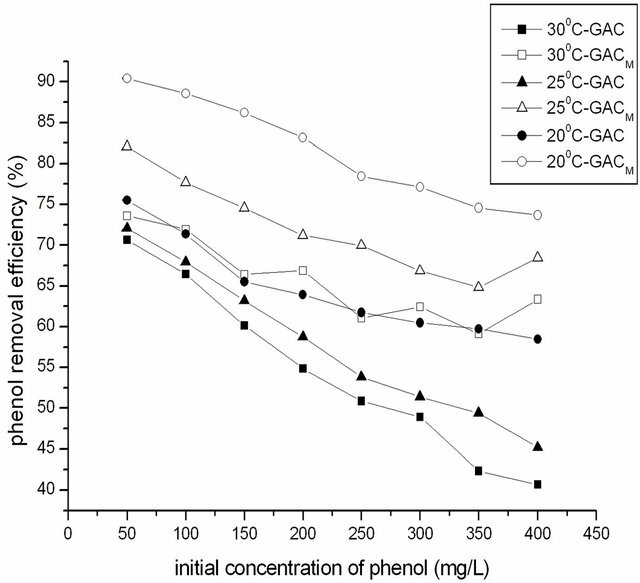 Results in Figure 6 showed the effect of initial concentration of phenol on removal of phenol by adsorption of GAC/GACM. It could be seen that with the increase of initial concentration of phenol, the equilibrium adsorption amount of phenol increased, while the removal efficiency of phenol decreased. Figure 6. The effects of initial concentration of phenol the removal rate. increase of initial concentration of phenol. On the other hand, the saturated adsorption capacity of GAC is limited. When the initial concentration of phenol is high, the phenol can’t be absorbed by GAC completely, so the removal efficiency of phenol decreased instead. So, at a certain dosage of GAC, the most suitable initial concentration of phenol should be determined by removal efficiency of phenol not equilibrium adsorption amount only. At the same time, it could also be seen that compared with that of GAC, the removal efficiency and equilibrium adsorption amount of phenol by GACM increased to a high level. Temperature was 20˚C, phenol concentration in water was 250 mg/L, and the dosage of GAC/GACM was 2.0 g (ratio of phenol to GAC/GACM was 62.5:2.0 mg/g). 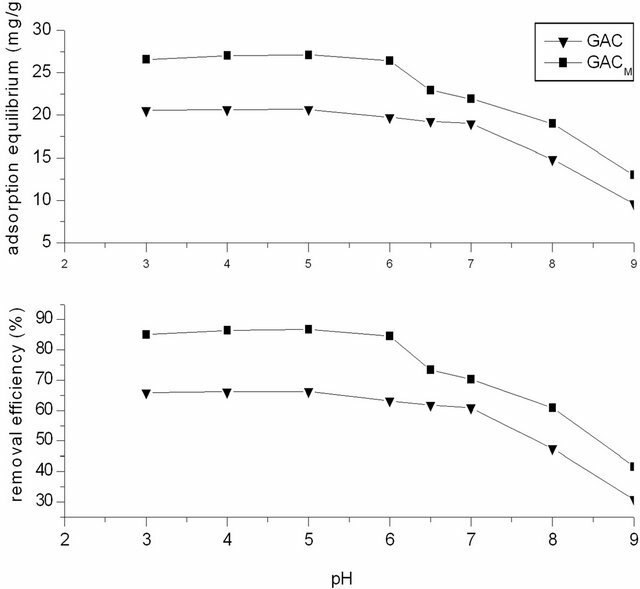 Results of Figure 7 show the effect of pH on adsorption efficiency of phenol by GAC/GACM. It could be seen that in acidic and neutral condition, the removal efficiency is high. When pH value is in range of 3 ~ 6, pH has no effect on removal of phenol by GAC and GACM. While with the increase of pH from 6 to 9, the removal efficiency of phenol decreased to about 30%, and the equilibrium adsorption amount decreased about 10 mg/g. This may be because that when pH is less than 7, phenol exists mainly in molecular form, which is slightly soluble in water, and easily be absorbed by GAC. While when pH is bigger than 7, phenol exists in ion form, which is soluble in water and is difficult be absorbed by GAC. This result also showed that the removal efficiency of phenol by adsorption of GAC is obviously superior to phenol salt. Figure 7. Effects of pH on the removal rate. of phenol. The removal efficiency increased about 25%, and the equilibrium increased about 7 mg/g. 1) Modification with potassium permanganate improved the adsorption capacity of GAC. Compared with GAC, the adsorption efficiency of Phenol with GACM increased 20%. 2) The adsorption equilibrium time of GACM is about 4h, as same as that of GAC. For 2.0 g GAC, the optimum concentration of potassium permanganate was 30 mg/L, and modification time was 90 min. 3) The adsorption of GAC/GACM is exothermic reaction. Modification affects the adsorption efficiency of GAC, but don’t affect the influence of temperature. 4) The adsorption property of GACM was better in acidic and neutral than in alkaline condition. 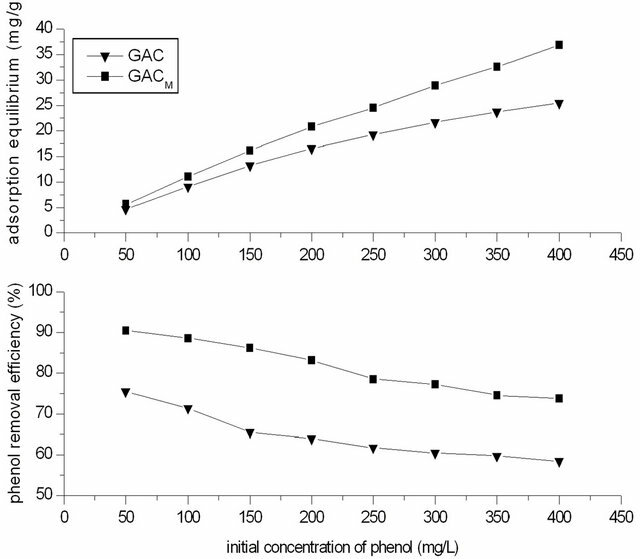 5) The ratio of phenol to GAC/GACM affects the adsorption efficiency of phenol with GAC/GACM. The optimum ratio of phenol to GAC/GACM was about 62.5:2.0 mg/g. J. Z. thanks to the supported of “Natural Science Foundation of Liaoning Province of Grant No. 2011010158” and “the Fundamental Research Funds for the Central Universities No. 3132013083”. G. P. Khokhlova and S. A. Semenova, “Ozonation of Fibrous Carbon Materials and the Effect of Molybdenum Compounds on This Process,” Solid Fuel Chemistry, Vol. 42, No. 1, 2008, pp. 54-59. S. Wilkinson, “Aquaculture Fundamentals: The Use of Lime, Gypsum, Alum and Potassium Permanganate in Water Quality Management,” Aquaculture Asia, Vol. 7, No. 2, 2002, pp. 12-13.